The main part of the first impression made by a food or beverage is its color. If the color is off, the taste and overall quality of the product will be substandard. That awareness has guided the coloring of foods for decades. Now health-conscious consumers are taking the more-than-skin-deep part very seriously. They want appropriate color, but they want it “natural.” Consumers are concerned about the foods and beverages they consume and how it affects their health and the health of their children. 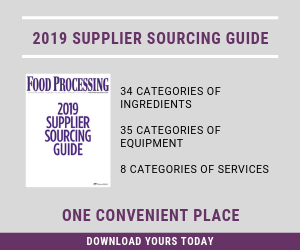 “Foods and beverages are coming under fire for calories, preservatives, artificial additives [even] excessive packaging materials,” says Doug Edmonson, director of marketing and technology for Sensient Technologies, St. Louis. Food colorings especially have been subjected to increased scrutiny. After decades of controversy, a study published last year in the British medical journal Lancet concluded with greater conviction that artificial colors and additives could “negatively influence the behavior of children suffering from hyperactivity and attention-deficit hyperactivity disorder. When using natural colorants, many processing conditions such as temperature, other ingredients and packaging, take on greater importance. Color loss also occurs due to the colorant’s exposure to heat, light or more alkaline conditions. “Such news makes consumers choose food with an ever more critical eye,” says Jeannette O'Brien, senior manager at GNT USA Inc. (www.gnt-group.com), Tarrytown, N.Y. GNT is a global producer of natural (fruit- and vegetable-derived) colors. “The trend for natural foods will undoubtedly become even more important in future years, and consumers increasingly are requesting information about the ingredients and additives in the foods they buy,” adds O’Brien. FDA lists all permitted colorants in 21 CFR, parts 73 and 74. There are a total of seven certified food colorants, all synthetic: FD&C (Food Drug and Cosmetics) red dyes No. 40 and 3; FD&C yellow dyes No. 40, 5 and 6; blue dyes No. 1 and 2; and green No. 3). “There are several additional benefits for using colorants to protect food. For example, caramel color in a beverage emulsion helps to protect flavors from light degradation,” says Jody Rener-Nantz, food science chemist for D.D. Williamson & Co. (www.naturalcolors.com), Louisville, Ky.
Another challenge to the natural color palette is to find products that act like “lakes,” synthetics best suited for applications with insufficient moisture to dissolve dyes. There are two forms of FD&C color additives: the dye and the lake. The dye is a color additive itself. A lake is the dye form attached to an aluminum or calcium substrate to make it insoluble. Food Ingredient Solutions created a new line of patent-pending natural pigments that behave like FD&C lakes. “Our natural pigments provide even coating at reasonable use rates for tablets, compound coatings, panned candies and seasoning blends,” he adds. The primary function of the phosphate is to immobilize cations that can affect ascorbic stability. “Another function for phosphates, with regards to color stabilization in beverages, is pH control,” continues Heidolph. Colors are sensitive to pH and can emit different shades or completely different colors if the pH is not controlled. She says phosphate salts are excellent buffering agents; they control the pH at a specific target range. For beverages, where the sodium level is a concern, Benephos provides equivalent functionality with more than a 70 percent reduction in sodium contribution. For most leading ingredient providers, inventories of naturally derived colorants read like a health nut’s shopping list: beta-carotene, lutein, lycopene, anthocyanins, flavanoid compounds from grape skin, blueberry and bilberry, along with turmeric – all are powerful antioxidant or anti-inflammatory compounds. That’s because most pigments in plants are there to provide protection from the harmful effects oxygen and ultraviolet radiation. Lycored Ltd. (www.lycored.com), Orange, N.J., boasts a color portfolio that addresses this trend toward colorants as healthful ingredients. The company pioneered development of lycopene, the red color from tomatoes. Lycored also provides orange beta-carotene (first isolated in carrots) and the yellow pigment lutein from marigold petals. “All have a wealth of documented health benefits and are suitable clean-label ingredients,” says Udi Alroy, marketing director. The amount of an ingredient needed to produce color is relatively small in comparison to that needed to provide antioxidant benefits. It’s not likely one dose of a colorant in common foods will confer measurable antioxidant benefit. Colorants are listed toward the end of an ingredient statement. For this reason, any antioxidant effect of the colorant would be minimal, although exact antioxidant impact levels are unknown. Still, it’s not unreasonable to assume the antioxidant value of naturally derived colors could add up over time. If the cumulative effects of the modern, low nutrient-dense diet can be negative, the opposite for those compounds with healthful benefit might also be true, especially for those colorings, such as carotenoids, which the body can store. “The effect of much food processing is to reduce the overall micronutrient load of the food,” says Boyd. “By using naturally derived colorants, perhaps we can add back some of what was lost. Izze Natural Sodas Inc. (www.izze.com), Boulder, Colo., takes a much-maligned but popular product, sugary soda, and turns it into health food: sparkling fruits juices made with pure fruit juice, sparkling water and colored with ingredients that contain natural antioxidants. Inspiring Izze were sparkling waters and juices sold in Europe, where natural colors are fast replacing artificial ones. “As the performance and color delivery of natural colors now meet modern processing requirements, they have steadily and almost completely replaced the use of synthetic colors within Europe,” says Lycored’s Alroy.